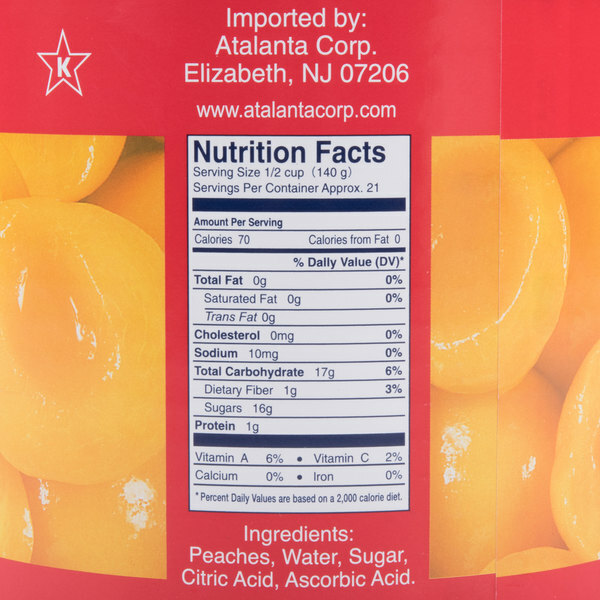 Bring the sweet taste of peaches to your restaurant, bakery, or cafe with this #10 can of peach halves in light syrup. Conveniently skinned and pitted, these peach halves are ready for baking. Whether you're baking traditional peach cobbler or trying out a new recipe for peach crisp to top ice cream, yogurt, or oatmeal, these peach halves are an essential addition to your pantry. Great for purees, glazes, and smoothies, you can create a variety of menu options ranging from drinks to desserts. 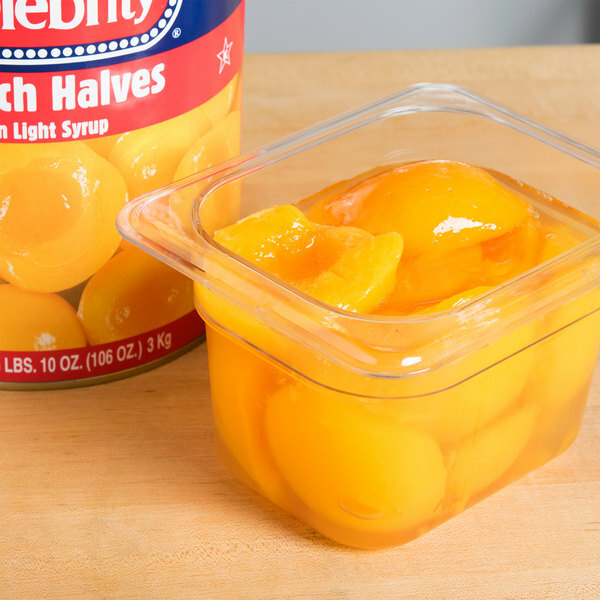 Already cut in half to save time in the kitchen, these sweet, juicy peaches are packaged in a convenient, generously-sized can for easy preparation and superior service. 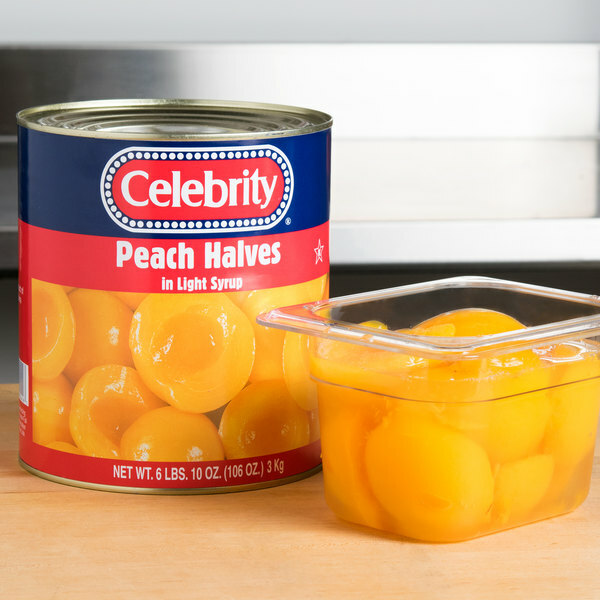 Indulge your guests in orchard-fresh peach taste with the convenience of canned fruit. Yummy, fresh tasting peach halves that are great for making fried pies and dumplings. Terrific taste and great when we cut them up and add cinnamon. We eat a lot of cottage cheese with fruit. And when we came across this size and price, we knew this was for us. The taste is 100% as it is compared to name brand peaches in a can. We also use them when baking cakes or tarts. No one has ever complained about the taste but wonderful praise from family and friends. The price! Need we say more?? 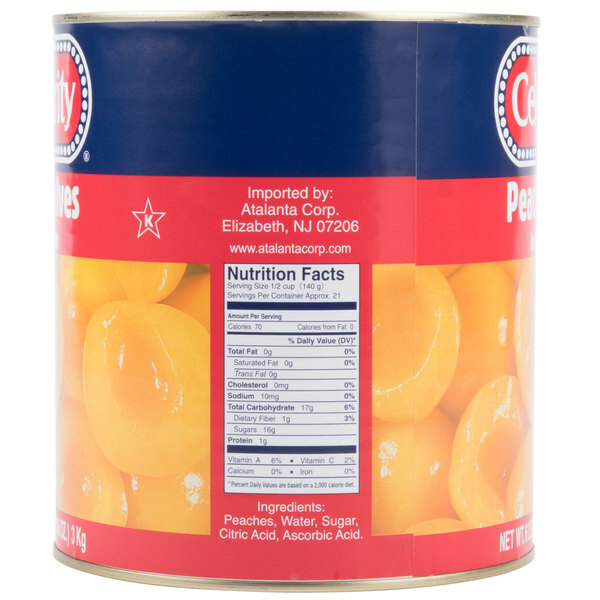 Best price and Quality for canned peaches. They have plenty of fresh flavor Shipping was fast and arrived in perfect shape. Would buy again. Bought 2 cases. Nice big halves of fresh tasting peaches in a light syrup. 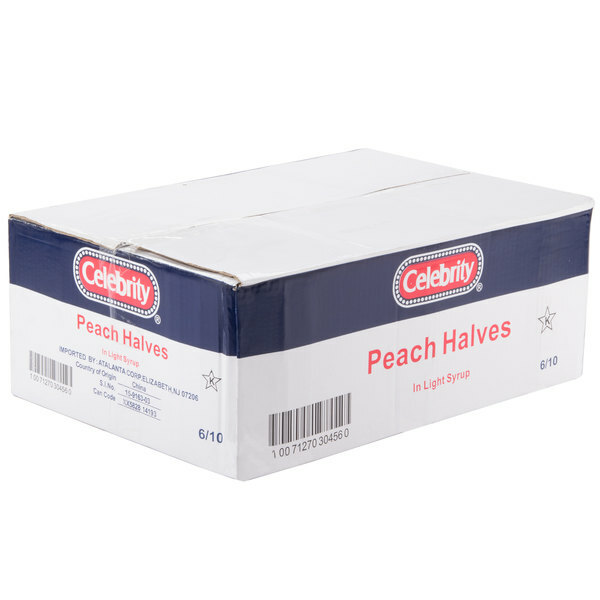 The peach halves from Celebrity are very sweet and bursting with a great flavor. Nice quality peach halves that are very sweet and have a great texture. I love using these peaches in our peach pies. They are already peeled and make preparation easy. 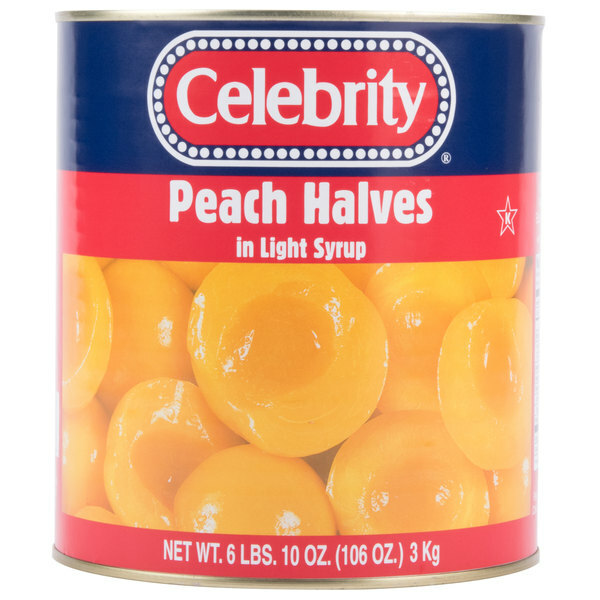 #10 can peach halves in light syrup comes in a six case. Peaches are perfect for making delectable desserts such as peach cobbler peach pie. You can also make different types of recipes for milkshakes combining this with other fruits you can have a mixed fruit smoothie. A great and easy snack for the kids lunches. I love the price and the taste and texture are excellent. They taste so fresh and sweet. We love these peach halves for their great texture and flavor. 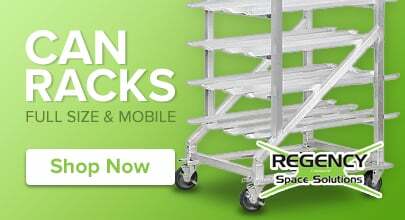 They are perfect for putting into trays for our salad bar. A great buy. 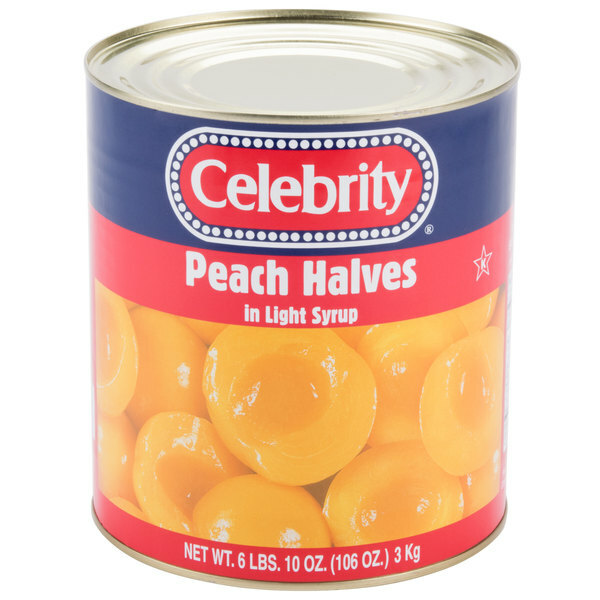 Very sweet tasting canned peach halves. They are nice and fresh and plump peaches. I like that I can get the peaches and other fruits and a whole case price. Shipping is fair and fast. These work well in all those peach desserts. They are quite good as is too. They are good in peach custard pie and perfect in iced teas.